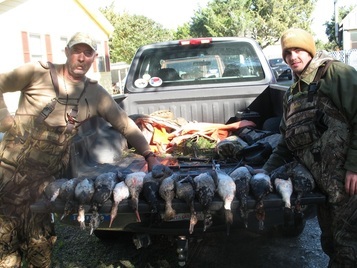 "Carrying on an Ocracoke tradition for 9 generations"
Native duck hunting guide Ronald Thomas ONeal, Jr owns several duck blinds on the open waters of Pamilico sound. RTO is fully USCG liscensed and can accomodate up to 6 hunters a day. A wide variety of species can be taken including brant, pintail, redheads, and more. Hunters are expected to have valid hunting licenses / stamps and to follow all state and federal hunting regulations.